An important security feature for card-not-present transactions appears on the back of most credit cards. 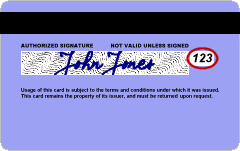 This feature is a three-digit value which provides a cryptographic check of the information embossed on the card. CVV2's Location: The CVV2 three-digit value for Visa/MasterCard, four-digit for Amex, is printed on the signature panel on the back of credit cards immediately following the card account number. The CVV2 value helps validate two things: That the customer has their credit card in his/her possession, and that the card account is legitimate. CVV2 is not contained in the magnetic stripe information, nor does it appear on sales receipts. If a CVV2 code is entered for a transaction, the CVV2 Response Code will be displayed in the Transaction Center. NOTE: CVV2 is optional by default. You can set CVV2 to mandatory in the Global Options section of your management console. Article written by Bill W.